“Bridges.” Orlando di LASSO: Prophetiae Sibyllarum (exc.) (1550s). György KURTÁG: Officium breve in memoriam Andreae Szervánsky, op. 28 (1988-9). Igor STRAVINSKY: Trois pièces pour quatuor à cordes (1914). Thomas ADÈS: Arcadiana (1994). John BENNET: Weep, oh mine eyes (1599). John DOWLAND: If my complaints (1597). Kuss Quartett: Jana Kuss, Oliver Wille (vlns), William Coleman (vla), Felix Nickel (vc). Sony BMG 88697092162 import (http://www.sonybmg.de/). With detours, these days I go straight from the 1620s (deaths of Byrd, Gibbons, Dowland and Bull) to the modern era; so this CD, which takes the same route, doesn’t feel odd. Coming on the heels of Le Sacre, Stravinsky’s modest Trois pièces vexed many. His first chamber piece uses a string-quartet setup but isn’t one. A Russian folk melody (invented? recalled?) opens, then the spastic, up-and-down gait of a popular clown. The last goes not at all with the first two, a liturgical item whose stasis-in-motion would drive Symphonies of Wind Instruments (1920). The Alban Berg’s high-pressure intensity and snap (in 1983 for EMI) remain unique; less inhuman, the Kuss is broader but sharp, clarifying organum procedures in the finale. String-quartet programs often disappoint. With pithy notes and pellucid sound, “Bridges” deserves some love (and spins). Amy Lowell’s poem upon hearing the Stravinsky in concert is here. “Early Music.” Guillaume de MACHAUT: Kyrie I-III* (early 1360s). Christopher TYE: In Nomine “Rachells Weepinge” (16th cent. ); In Nomine “Farwell My Good 1. Forever” (16th cent.). David LAMB: Långdans efter Byfåns Mats** (1997). John DOWLAND: Lachrymae Antiquae† (1604). Arvo PÄRT: Psalom (1991-3). Harry PARTCH: Two Studies on Ancient Greek Scales (1946). Jack BODY: Long-Ge (1987). John CAGE: Totem Ancestor for Prepared Piano (1943); Quodlibet (1950). TRAD. : Brudmarsch frå Östa††. KASSIA: Using the Apostate Tyrant As His Tool (9th cent.). Louis “Moondog” HARDIN: Synchrony No. 2‡ (1994). PÉROTIN: Viderunt omnes (c. 1200). Henry PURCELL: Fantasia for 4 Viols in B flat major, Z. 736 (1680). HILDEGARD von BINGEN: O virtus sapientiae (12th cent.). TRAD. : Uleg-Khem‡‡. Alfred SCHNITTKE: Collected Songs Where Every Verse is Filled with Grief (1984-5). TRAD. : Requiem: Bells – Tolling of the Knell. 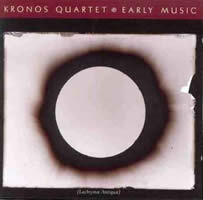 Kronos Quartet: David Harrington, John Sherba (vlns), Hank Dutt (vla), Joan Jeanrenaud (vc); Marja Mutru* (harmonium), David Lamb** (bagpipe), Wu Man† (zhong ruan, da ruan), Olov Johansson†† (nyckelharpa), Judith Sherman‡ (drum), Huun-Huur Tu‡‡ (vocals, igil, byzaanchi, toschpuluur). Nonesuch 7559-79457-2 (http://www.nonesuch.com/). I bet Tye’s In Nomines were selected for their evocative titles. Despite tempos that rush a tad and scrubbed textures (no head-cold density typical with viols), I’m glad they made it. The Purcell is a degree manic. Dowland’s Lachrymae Antiquae (Old Tears, first of seven Lachrymae settings) is tougher to foul up, though the piquant Chinese lute stand-in is too prominent. Kyries from Machaut’s Messe de Nostre Dame appear at intervals and leave one wanting more — instantly recognizable, harmonic clashes intact. Floating all the Viderunt omnes verses within a dynamic scheme requires nerve, and Hildegard’s antiphon stays aloft, but I miss the words to both. Schnittke’s Collected Songs is pulled from his Choir Concerto; it emerges as maudlin movie music, an unlikely fate given the original. Kassia (c. 810-bef. 867, Constantinople) may be the first woman composer whose oeuvre can be examined. (The Eastern church still utilizes about 30 of her 49 hymns.) Using the Apostate Tyrant As His Tool was prepared for this CD by scholar Diane Touliatos. It has a noble melodic line supported by drones, and can haunt one for days. VocaMe, a Munich vocal sextet, is planning a disc of her material. Samples can be heard here.